A doubly-terminated green chlorite phantom clusterette, miniature sized and pristine at 1/4x 1/2x 1-3/8" long, from Garland County, Arkansas. 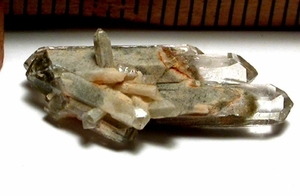 Sparkly and lightly naturally etched doubly-terminated twin crystals clearly show fine phantoms, and are penetrated with multi-directional others including a little crystal spray of phantom crystals. A band of sand colored suede-like occlusion highlights the fabulous detail of this specimen, too.